Chad Owen Brand, ed., Perspectives on Spirit Baptism: Five Views (Nashville, TN: Broadman and Holman Publishers, 2004), 338 pages. 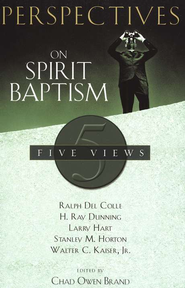 Perspectives on Spirit Baptism is a collection of five scholarly essays that define Spirit Baptism from five traditions: Reformed (Walter C. Kaiser), Pentecostal (Stanley M. Horton), Charismatic (Larry Hart), Wesleyan (H. Ray Dunning), and Catholic (Ralph Del Colle). Each view is formatted as a chapter, which concludes with responses from the remaining four scholars. The space afforded each view differs widely in some cases. For example, the Reformed view is only 22 pages, whereas the Charismatic view is 64 pages long; the difference (42 pages) is longer than the Catholic view (39 pages). The Pentecostal and Wesleyan views are 48 and 49 pages, respectively. Regarding the responses, there is again a disparity. Horton’s responses total only six pages, while Del Colle amasses just over 14 pages (the average was 10 pages). All of the contributors to this volume are terminal-degreed scholars, but were they the most qualified? What brings this question to mind are the credentials of Kaiser and Horton. These are highly distinguished scholars, but their forte is the Old Testament, whereas Spirit Baptism is a New Testament phenomenon. Both men are venerable patriarchs (Horton will soon be 90) of their denominations and have high degrees of name-recognition (which publishers desire), but I sensed a lack of edge and freshness in their presentations and responses. Kaiser starts things off with a historical summary of the responses to Pentecostal theology by John Stott (1964) and James Dunn (1970). Mysteriously, forty years after Stott’s dividing of Scripture into didactic and historical, Kaiser makes the same mistake, favoring Paul’s “didactic” passages over Luke’s “narrative.” Kaiser ignores three and a half decades of scholarship, beginning with I. Howard Marshall (1970) and continuing to this day, that corrects the misguided notion that Luke was merely a historian. Neither does Kaiser fare well in the department of fairness. In his attempt to connect Spirit baptism with conversion, he quotes Pentecostal scholar R. P. Menzies in order to counter him with a quote from J. B. Shelton (also a Pentecostal), but he unfairly ends the Shelton quote at a point that serves his purpose. Had he continued with the same sentence, it would have destroyed his point. Here is Kaiser’s quotation from Shelton: “[Although] Luke is not averse to associating the Holy Spirit with conversion. [Kaiser even omits the ellipsis that indicates an omission. ]” Here is the omitted clause and next clause: “…this is not his major pneumatological thrust. Some misunderstanding has arisen when the role of the Holy Spirit in empowering for witness is confused with conversion.” But as serious as this violation of scholarship is, it pales in significance to Kaiser’s later mischaracterization of Larry Hurtado’s position on tongues as the initial evidence of Spirit baptism. He quotes Hurtado approvingly when the latter confirms that the NT does not raise the question of the initial evidence of Spirit baptism. Then he chastises Hurtado for not thinking that this renders the doctrine invalid and for thinking that experience “can fill in the needed evidence here!” (30). Kaiser has grossly misread Hurtado, whose last clause of the quoted essay reads, “…the doctrine of initial evidence, whatever its historic significance for institutionalized Pentecostalism, should be set aside as a sincere but misguided understanding of Scripture.” Was Kaiser so desperate to compare the supposed experience-based Pentecostal view of Spirit baptism to Evangelical rationalism that he totally misread Hurtado? Whatever the case, Kaiser turns Hurtado into a tremendous strawman, and he owes Hurtado an apology, since Hurtado seems to be on Kaiser’s side. Hurtado is not a Pentecostal but appears more like a Lukan cessationist who does not believe Luke intended to teach Theophilus anything about the relationship between tongues and Spirit baptism even though Luke, following contemporary Greco-Roman rhetorical conventions, strategically linked them in pivotal scenes that demonstrate the programmatic Christ sayings of Luke 24:45-47 and Acts 1:4-8.